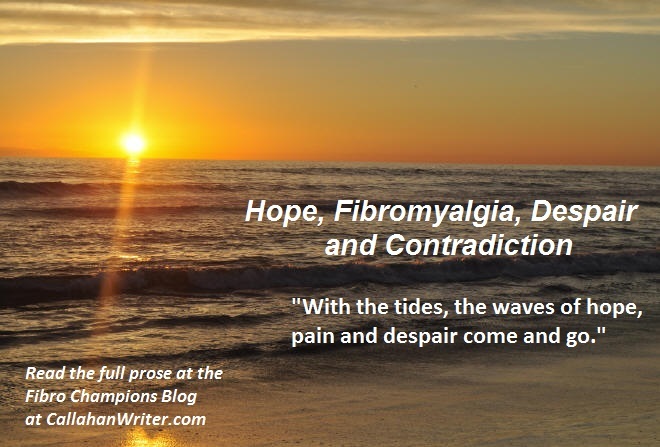 Hope, Fibromyalgia, Despair and Contradiction | Troy C. Wagstaff aka CallahanWriter Blog: Topics of interest include Western Historical (1865-1899) Topics. Additionally inspirational Christian and Fibromyalgia interests. Hope is like the waves of the ocean crashing on the beach. At first your feet get wet, and over the time, the waves get bigger, bringing in more hope, making you more wet. Eventually the waves of hope completely engulf you leaving wet with hope. Then the waves recede back into the tumultuous ocean to leave all but your feet dry again. Pain is like the waves of the ocean crashing on the beach. At first your feet get wet, and over the time, the waves get bigger, bringing in more pain, making you more wet. Eventually the waves of pain completely engulf you, leaving you wet with pain. Then the waves recede back into the chaotic ocean to leave all but your feet dry again. Despair is like the waves of the ocean crashing on the beach. At first your feet get wet, and over the time, the waves get bigger, bringing in more despair, making you more wet. Eventually the waves of despair completely engulf you, leaving you wet with despair. Then the waves recede back into the turbulent ocean to leave all but your feet dry again. With the tides, the waves of hope, pain and despair come and go, engulfing you, but eventually leaving you dry and hopeless, with less pain and less despair. The contradictory waves of fibromyalgia are a fickle thing always at the beckoning of the tumultuous sea.